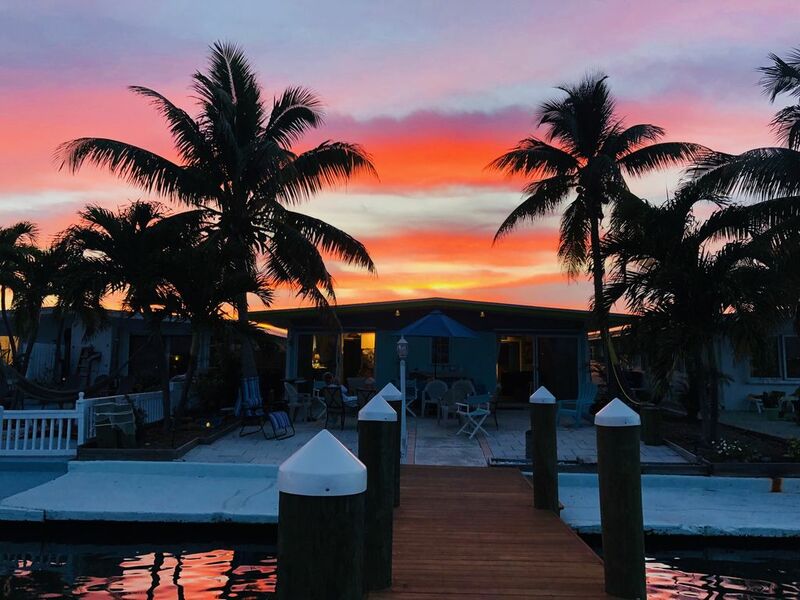 Tranquil blue/green waters w/ the greatest fishing in the world awaits you here at the The Jewel of the Florida Keys, located in Key Colony Beach, FL. This palm paradise with tropical breezes offers great restaurants, beaches, pool, golf course, and fishing all within walking distance of our cottage which is located on Bonefish Bay. Easy access by boat to the ocean and the gulf. This original boatel was built in the '50s offers three bedrooms, two w/ king size beds, 4 twin beds, one queen bed and three baths. The patio facing the bay has afternoon shade and a breeze at all times and no mosquitos. Our cottage has wireless Internet, kayaks, life jackets and older fishing rods for your use. This Keysie Cottage accommodates 6 people maximum. There is no extra charge for maid service. Come and enjoy the real taste of the Florida Keys. RATES ARE INCREASED IN JAN., FEB., AND MARCH. If you are not familiar with Key Colony Beach you will find this area one of the nicest, safest tropical islands in the Florida Keys. Location is perfect, midway between Key Largo and Key West. Relax and relish the gorgeous opal colored water or view the sunrise from our patio. WE HAVE A NEW 30' DOCK! The entire house was remodeled after Hurricane Irma. The best fishing and diving in the world are just minutes away on the only living coral reefs in the United States. Sit under the Palm Trees at the Beach and enjoy a cool Drink at the Cabana Club which includes Pool, Beach, Snack bar, Restaurant, and Bar. Free Membership Included with this rental. This cottage has been in our family since the '60s. After Hurricane Irma, we are finally back on vrbo. Half the roof was torn off and all furniture ruined in the hurricane but now it's back together with, new electric, plumbing, and new roof installed. Our son did most of the renovations with the old rafters from the roof being made into counter tops. He was here 8 months along with his fiance, painting, building and replacing all furniture and appliances. Bless their hearts!!! My father in law bought this property in '62 and absolutely loved fishing. It's the best fishing in the world. Enjoy fishing from our dock or out in the gulf or ocean. Our particular location has a lot of advantages.One is always a breeze, no mosquitoes, afternoon shade, on a small bay with a beautiful view and lots of convenience to stores, restaurants etc. Easy access by boat to ocean or Bay. 3 Newer tile bathrooms with showers. 25 ft. to Bonefish Bay. We have kayaks for your use. Cabana Club, including heated pool, hot tub and large beach with chairs and views. FREE Cabana Club Membership includes, Pool, Beach, Snack Bar, and Lounge. A couple of kayaks also for your use. This was a great unique house. It was clean, well equipped, the beds were comfortable and the bathrooms were a good standard. We spent everyday on the dock chatting to the neighbors. The house had membership to the Cabana Club at the end of the street which was a nice hang out with a private beach and pool. We will be back. We were travelling with our two young Sons, and we absolutely loved the place. We were minutes from Sombrero, Seven Mile, and Bahia Honda. The boys caught Mangrove Snapper, and Jack right off the back dock. We paddled the Kayaks over to Sparky's to get bait and Chow. Great place, great trip. We stayed in this half duplex for two weeks near end of April 2018. We have been visiting the Keys since 2009 to fish and get out of the nasty winters in the Pacific Northwest. We always want a view of the water and this property has a great view of water and sunrise. Nice things about this place other than the views are the kayaks are in great shape, Sparky's is a short walk. The Cabana Club has a pool and small sandy beach within a 15 minute walk, gas barbecue, close to shopping. Also the price is great, have stayed in places 2 to 3 times the cost. Owner has several notes around unit with tips on how to operate appliances and TV, follow them. Only downside I found on this trip is there are 3 bikes but the woman's bike has a couple of issues that need to be addressed, the seat likely needs to be replaced as it rocked backwards, also the chain fell off. Mar-A- Largo , don't stay here. If you want to stay at a place that lets you enjoy the Cabana Club, Sunset Beach, Bonefish Bay ( in your backyard), restaurants in walking distance, clean and comfortable acomodations, use of bikes, fishing tackle and Kayaks then speak with Denise Samuels the owner. Denise is friendly and acomodating like her rental property. We were there this year for one week. We'll be back next week for three weeks. That says it all. We rented for 1 week at the end of October and were very happy with our trip. The unit is accurately described and is very user friendly. Excellent location and water frontage. We caught 19 different species of fish from the dock. Kayaks are like new and easy to use. Saw Manatees and a Bull shark. Very cool. Key colony is my favorite spot in the Keys. Traveled from Montana and can't wait to return. We just got home from our stay here and figured we would share our experience. Overall we had an amazing stay and would definitely return. There were plenty of Pros, and a few Cons to this rental. Pros- 1- The location was perfect. We never stayed in Key Colony Beach before and when we return we will definitely be staying there. There were a few great restaurants within walking distance, our favorite being Sparky's Landing which we went to 4 times. 2- Access to the Cabana Club was a huge bonus. It was great for the days you wanted to just lounge around and drink by (or in) the pool or go to the beach. The food and drinks there were all great and very reasonably priced. The beach there was also very well maintained and had very little if any sea grass. 3- THE BACK YARD!- The back yard was amazing and was perfect for fishing and sight seeing. We caught a ton of fish right off the dock like snapper, grunts, catfish, and a few others we couldn't identify. We were also visited daily by some manatee which the kids loved and saw sting rays, barracuda, and some Sargent Majors directly under the dock. We brought our kayak and paddle board and enjoyed nightly sunset paddles. 3-The property manager (Barry I believe) was extremely attentive to any issues we had and was over within minutes to help. 4-Garage storage space!- we couldn't find many other units that had this amenity and allowed us to store our bicycles and fishing equipment in. 5- Included a garage full of goodies to use including 3 kayaks, bicycles, tons of fishing equipment and tackle, life jackets etc. Everything was in much better shape than what we expected from a vacation rental. 6-The master bed was amazing. It was some sort of memory foam mattress and both my wife and I slept amazing while there. There was also an abundance of towels, linens etc, that were great. Cons- 1- The toilet in the master bath was kind of wobbly. We were afraid we were going to tip over when we first got there but got used to it by the end. 2-the kitchen faucet is extremely loose and not well fitted. We were afraid it was going to rip off whenever we washed dishes or our hands. A simple tightening of the nut under the sink should fix it. 3- the couches in the living room are extremely worn and could be replaced. That being said they were very comfortable and I actually fell asleep on one the first night which I haven't done in ages.